A lovestruck octopus, who just so happens to not have a brain, is hopelessly unable to reach their companion. Fear not, however, this octopus has a pretty decent replacement for a brain—a player! The concept is fairly simple; guide the Blue Octopus towards the Purple Octopus. Things tend to get more and more complex throughout the playthrough, though. In world 1-1, you are given your basic tutorial. The green arrow above the Blue Octopus’ head indicates the direction he will go, and every time the little guy hits a wall it will change direction; the green arrow typically moves in a clockwise fashion. For example, if the green arrow is facing towards the left, once he smacks his face into a wall he will start to move down. The Player can easily discern the use for the yellow arrows that will appear on the map. These will change the direction of the Blue Octopus to whichever direction they point, regardless of green arrow indicator. You are given a time and move limit for every level. These aren’t mandatory goals, just something extra for the completionist. In order to make most time goals, the player must hold the right mouse button down to speed things up. Though this is beneficial for time, when the levels become more complex, it can present challenges. There are obstacles introduced rather quickly once the player has gained a bit more knowledge on how the game works. Hungry, tooth filled maws start to create voids in the floor that have a peculiar liking for the taste of octopus. When you are a poor travel guide for the Blue Octopus, you’re treated with a unexpectedly brutal death scene. The Blue Octopus slowly descends into a gaping maw with bloody clouds complete with a departure of his spirit. Brainless, but not without a soul. 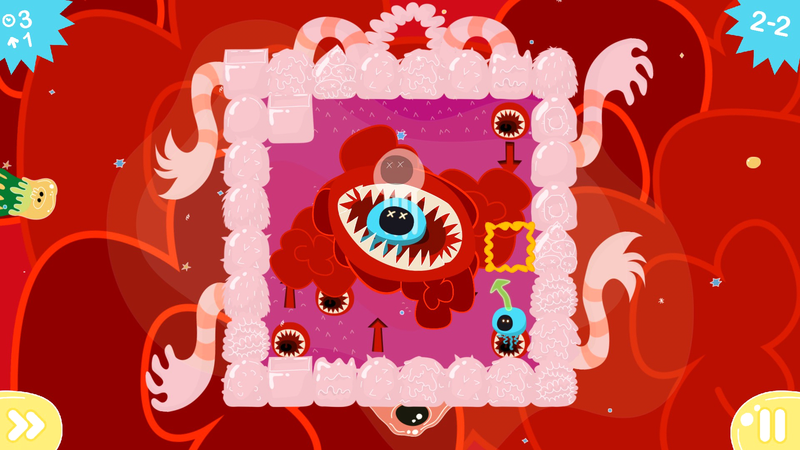 When a level first starts, time is frozen, giving the player time to think through how they will get their little blue friend over to intertwine tentacles with its mate, and with a click of the left mouse button, off he runs. Often times, the yellow arrows must be moved more than once, frustrating the players who don’t take the time to think, or just mash the RMB for the speed runner in them, I often found myself running into a maw of sadness once a level, just out of sheer impatience. I am rooting for this guy, and believe everyone deserves love. Later, the game introduces the red arrow, and immovable objects standing in the way of love. These arrows act exactly like the yellow arrow, but the player cannot move these. Armed with a bit of wit and a yellow arrow, though, the Blue Octopus can navigate his way to his hunny. Along side the gaping maws are spiked tentacles attached to a lightbulb with a skull inside of it. The tentacles are the more evil out of the two. If the player is heartless and guides the Blue Octopus into these, they will smack their charge to death. Often, the path of the Blue Octopus is deliberately set to run into these things, with no yellow or red arrow to avoid them. The solution is simple, left click on the lightbulb-skull and it will retract a set of its tentacles, the trade-off however, is that a different tentacle will pop up. Later in the level, the player will often have to click on the lightbulb-skull multiple times to make sure the Blue Octopus isn’t out tentacled in front of his lady friend. These weren’t necessarily a difficult addition to the game. I wasn’t incredibly tripped up, but I did run into them from time to time because of wanting to keep under the time limit. The concept is simple enough, and with an appropriate ramp in difficulty, the game is an excellent time waster for someone looking to kill anywhere from a half hour to an hour. I found myself wishing that this were a mobile game rather than a PC game, however. Having gotten to world 8, the game gets rather difficult, taking quicker than expected reactions and real thought. The Blue Octopus doesn’t have a brain, but the Player had best have one. 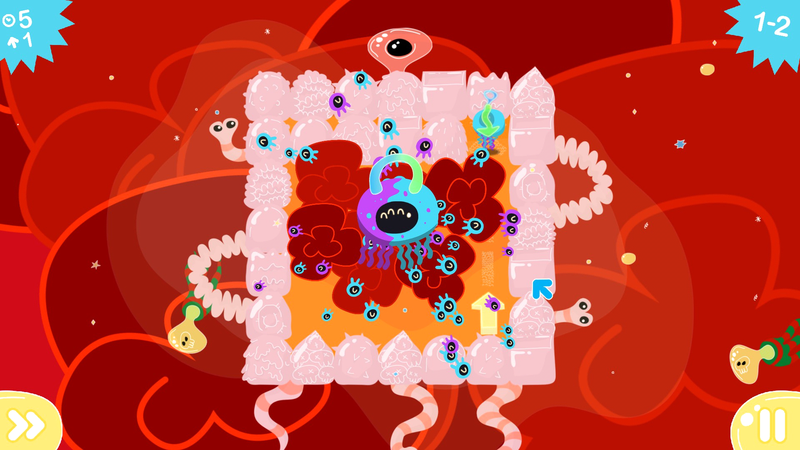 The art direction reminds me of something straight out of Foster’s Home for Imaginary Friends, which isn’t a bad thing. It’s rather cutesie and appropriate for the theme. The sound design is well done, something you would expect from a high quality mobile game. However, the soundtrack is an endless loop of an acoustic guitar riff that reminded me of something you would hear a college student play if they took a guitar class for one semester to try and impress the ladies. That being said, I don’t think that’s necessarily bad. All of these things come together for a well-designed puzzle game that would be an excellent thing to have while waiting in a doctor’s office, parent-teacher conference, or in a bathroom. With a price tag of $6.99, I’d say the price is worth it for something that you will ultimately spend about three to four hours on to kill time. There is a mobile version for $1.99. I’m not entirely sure of the differences here, I would assume it is a shortened experience, but if the Steam version were on mobile, for the price of $6.99 I would buy it.